The neck and low-necked are fragile areas. These areas change over time, as discussed in the special information sheet ‘Rejuvenating the neck and low-necked’. This article discusses wrinkles on the neck and low-necked. Horizontal wrinkles and slackening skin can appear on the neck. 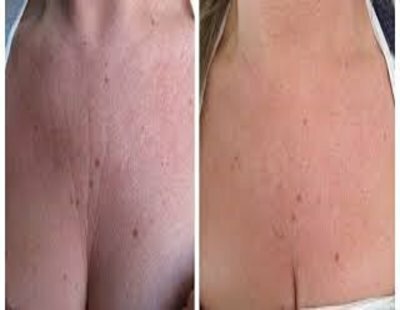 The décolletage is affected by vertical wrinkles, starting between the breasts and fanning out between the clavicle bones. – Ensuring daily hydration of the skin. – Protecting the skin from external aggressors such as tobacco or the cold. Lightly reticulated hyaluronic acid (restylane skin boosters) or mid-reticulated hyaluronic acid like Restylane. Skin Booster hyaluronic acid is used to thicken the dermis and avoid it thinning. Two syringes are injected in the first instance, followed by another syringe a month later. The treatment is adapted to the needs of each patient. Mid-reticulated hyaluronic acid like Restylane is used to add volume and support the dermis. Several mesothreads are inserted into the middle and deep dermis along the path of wrinkles. The induced dermal stimulation attenuates the depth and visibility of wrinkles. The result is obtained within 3 months. A session is usually sufficient. Medium peel exfoliates the epidermis and part of the dermis. Superficial peels are not useful because wrinkles always reach the dermis, superficial peels treat only the epidermis (there is a dermal stimulation but there is no dermal ablation). We must be careful and analyze the characteristics of this fragile skin (thickness, hydration, pilosebaceous appendages ...) if we want to avoid complications. The post-act redness lasts about 2-3 weeks. It’s been 3 months that I did injections on my neck, and I’m very satisfied with the result. Doctor Romano is very sweet and reassuring. Really satisfied with the result of the injections on my neck wrinkles. Very competent and remarkable work. I had excellent results on the wrinkles of my cleavage. Thank you. I noticed very fast results with the injections on my cleavage. The quality of the treatment is not up for questioning. I recommend her!